We created the Oasis® OH-20 Hygrometer Holder to enable you to measure the humidity at the body of your guitar without risk of scratching the soundboard. The soundboard and body of the guitar are where cracking from dryness is most likely to occur. The Oasis® Guitar Hygrometer Holder allows you to place the hygrometer by the sound hole of your guitar near the humidifier when the guitar is in the case. How does it work? Made from a soft loop Velcro type of material, it wraps around the first string and provides a flat surface where the hygrometer can be attached. An adhesive backed piece of hooked Velcro type material is attached to the back of the hygrometer. 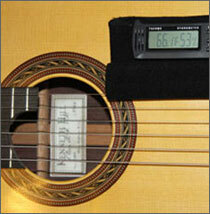 Oasis® OH-20 Guitar Hygrometer Holder $9.95.